There are still a few folks at the SEMA Show, who haven't heard of the OPTIMA Ultimate Street Car Invitational, presented by Royal Purple and KN, but Richard Caleel isn't one of them. He actually came to our booth and asked us to come look at his car (we've been getting that more every year). As it turns out, we were interested in having at least one CTS-V in the OUSCI and there were more than a few to choose from. We inquired about one of the more high-profile CTS-Vs at the show, but the owner/builder never responded. Perhaps he was worried about how his car's performance would impact his reputation as a builder? Whatever the reason, we knew the crew at D3 would have some good choices for us, as we previously-invited Bob Michael's CTS-V to the 2011 OUSCI. They had at least six cars at SEMA and when we asked which one they thought would be a good choice, they pointed us in Richard's direction. 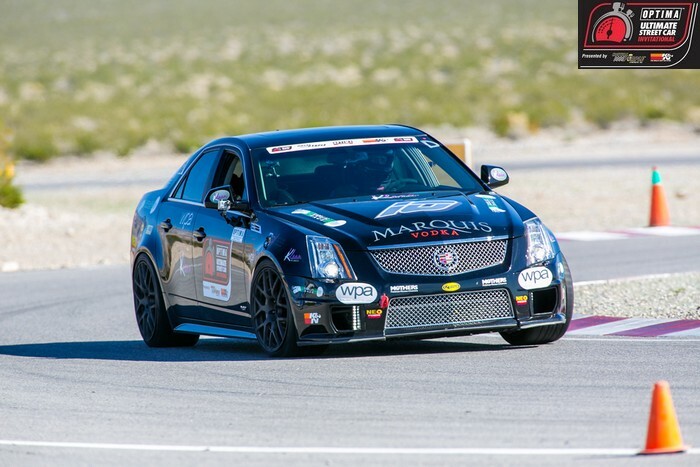 Richard had already captured the C2 Class title in the Cadillac Challenge in his 2012 CTS-V, so we expected he had a fair amount of track time under his belt and had his car fairly-well sorted out. He certainly had plenty of sponsor decals on it, including Worldwide Production Agency, Cadillac Race, D3 Cadillac, KleanLA, Marquis Vodka, Toyo tires and Race Ramps. Those times aren't easy to come by and Caleel certainly had some help, courtesy of upgrades installed by D3. Richard's CTS-V now has Kooks headers, a Corsa exhaust system and all kinds of upgrades from D3, including a new lower pulley, upgraded heat exchanger, high-flow intake, intake manifold spacer, a ported polished supercharger and snout and custom tunes for either 90 or 100 octane gas. D3 also added a full array of suspension upgrades, including front and rear sway bars and a chassis brace, as well as a KW coilover suspension. D3 also added front brake ducts and a rear differential cooler. D3 slotted rotors, porterfield brake pads and stainless brake lines help bring 19-inch TSW Nurburgring wheels to a halt and a G Force five-point harness keeps Richard in the same spot while all the fun stuff is going on. It may not look heavily-modified from the outside, but the end result is 620 horsepower and 598 lb.-ft. of torque in a 4,400-pound car. So how did he think he fared at the 2012 OUSCI? "It was a bit daunting, since I had no idea what to expect," admits Caleel. "The car is corner-balanced for road courses. If I had time, I would've adjusted my coilover for the autocross and then back again for the road course settings." Richard did feel like the car would've benefitted rom fresh pads and rotors, but he couldn't get them in time for SEMA and hurt his times as a result. Caleel felt his lack of skill and experience contributed to his 31st-place finish in the RideTech Autocross. 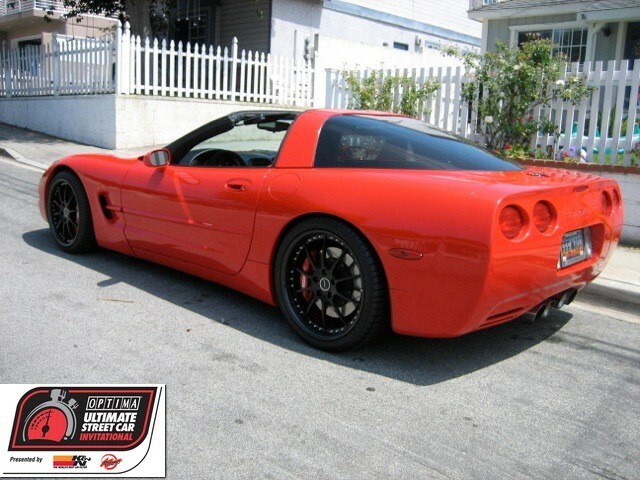 In the BF Goodrich Hot Lap Challenge, Richard had his lines all set in practice, but had a hard time focusing with the ZR1 camera car trailing him throughout his laps. Caleel never did find his line and missed his shift on the front straight on all three laps. Needless to say, he was very disappointed with his 26th-place finish. Richard improved with each pass in the Wilwood Speed Stop Challenge, but his brakes were fairly worn out from a season of racing. All in all, Caleel feels he was probably more conservative than he should've been, given the OUSCI doesn't give competitors much time to ramp up their aggressive driving. Richard's CTS-V will have a custom widebody kit installed over the winter, which will allow him to fit larger rubber and may also get a coilover swap. He also plans on running in OUSCI qualifying events next year, as he doesn't expect to get a golden ticket invite two years in a row. He was very impressed with the format of the event and the quality and performance of the cars in the field. We were glad Richard was willing to step up with his Cadillac and put it on the track, because experience showed us again this year that there were more than a few folks at SEMA who were only there to let folks know how good their cars looked.